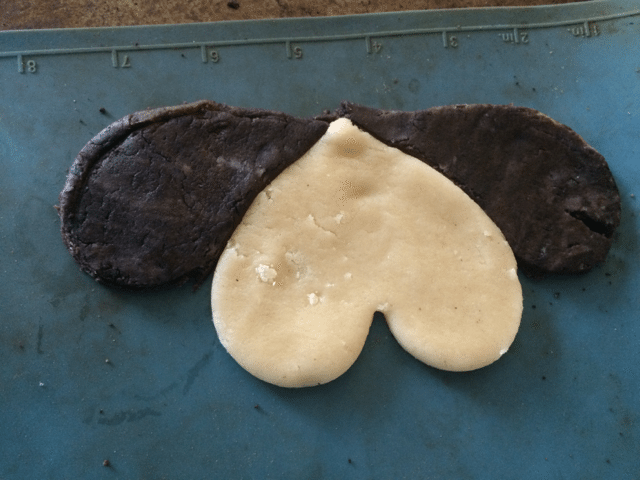 My son was talking about the Valentines he was making at school, sure you have seen it when kids make a puppy out of two hearts? 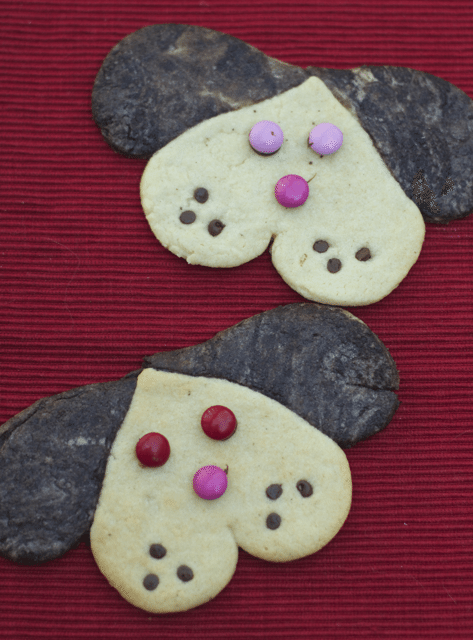 While he was telling me about this Puppy Valentines it reminded me about a cookie I made years before I was blogging. 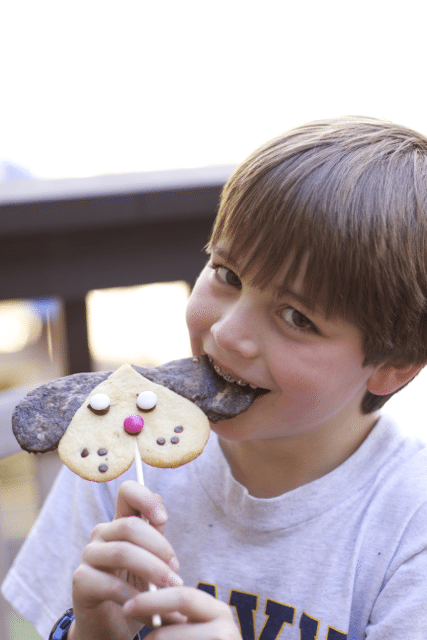 It is so simple, as a short cut I used a sugar cookie mix . Really in a rush, you could use the refrigerated cookie dough if you dare. (I just don’t like the flavor). 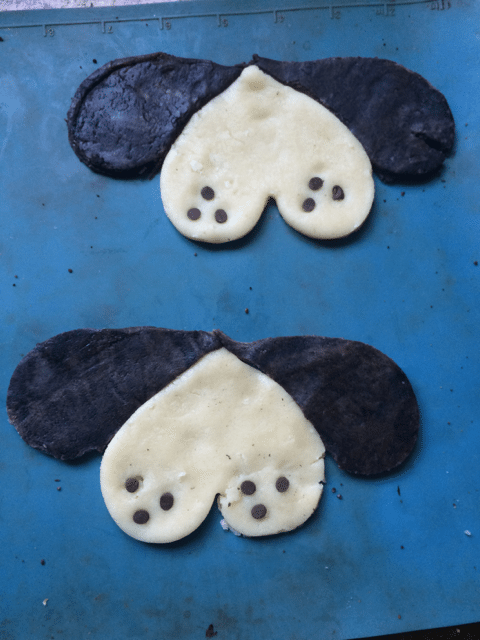 One batch makes 8 puppy Valentine Cookies so if you wanted to make them for a school class party I would get a smaller cookie cutter. 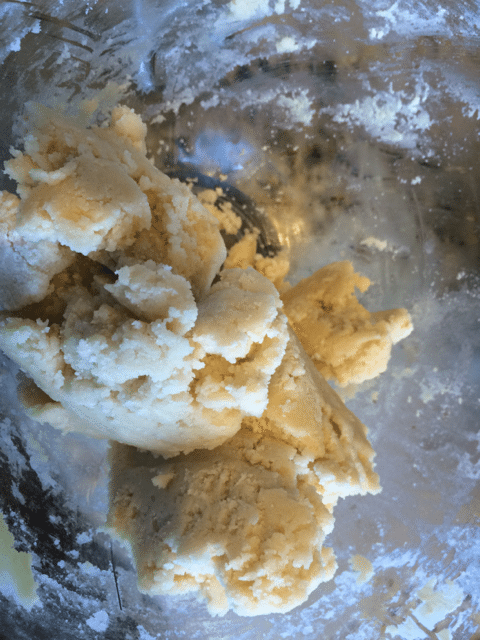 Make your sugar cookie dough per the directions. Split the dough in half and add cocoa powder and mix it well so it becomes mainly a solid chocolate cookie. 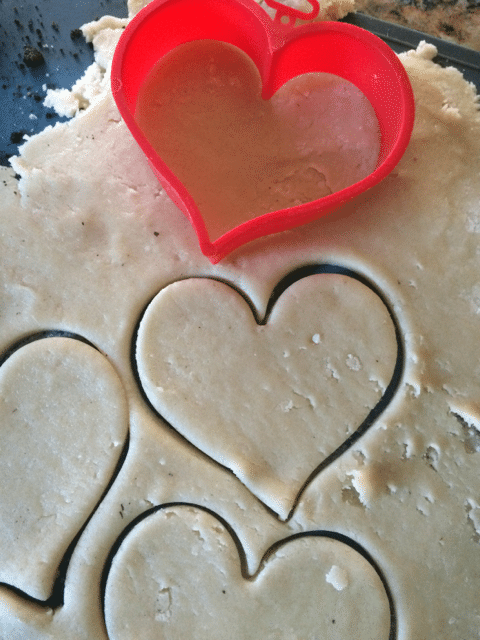 Roll out both of your dough to 1/4 of an inch and cut out the hearts. You should get about 8 cookies per flavor. 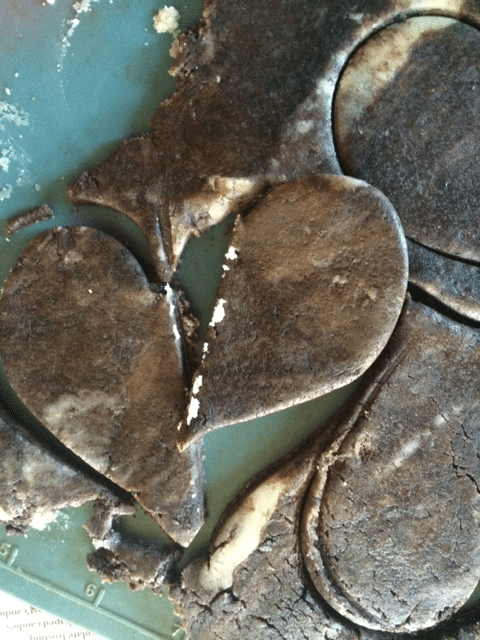 Lay the vanilla cookie heart upside down on a cookie sheet with a silpat or parchment paper. Cut the chocolate heart in half lengthwise. Place them right next to the side of the vanilla hearts. Add 6 mini chocolate chips to the bottom of the puppy. When cooled, add the eyes and nose M& M’s with frosting or melted chocolate. 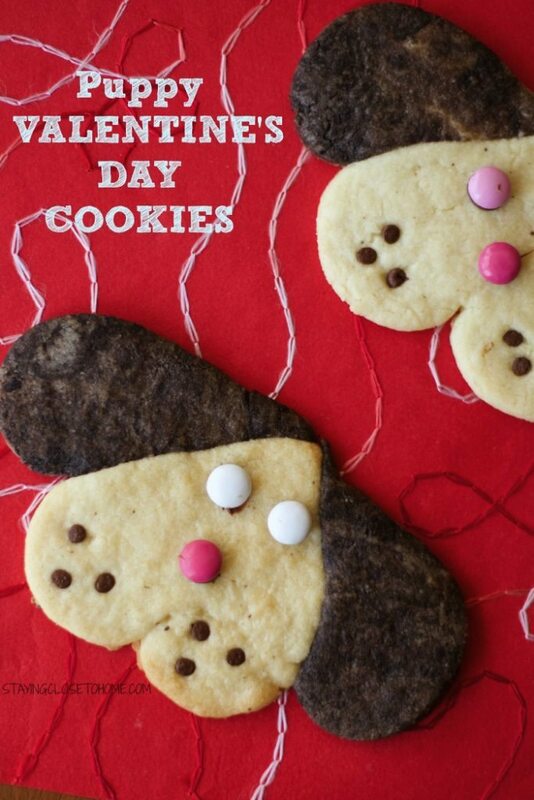 My boys really enjoyed these Puppy Valentines Day Cookies and definitely put a smile on their face. Next time I might reverse some of the hearts too. Adorable! 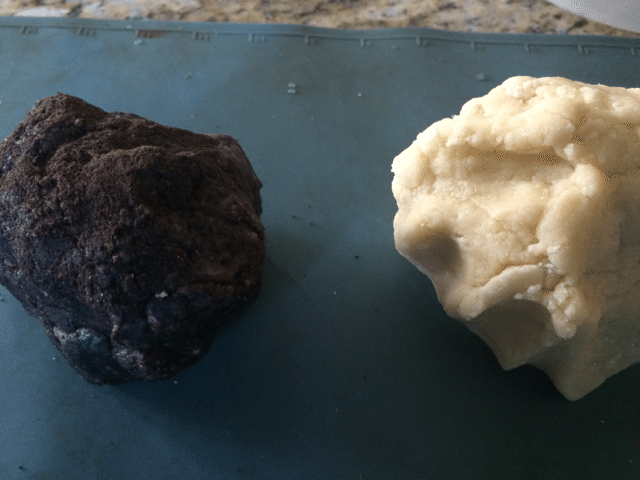 My grandgirls are gonna love this recipe! Thank you for sharing. I’m popping in from Food Frenzy party. thanks so much for pining this. Those are so cute and simple to make too! Pinning!